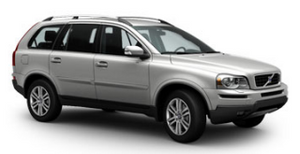 The gentle but capable XC90 is solid and refined and handles more like a taut European sedan. It reacts masterfully on twisting roads and functions with precise control. Expect a smooth and solid ride as the base suspension irons out pavement imperfections. The T6’s suspension is significantly stiffer and adds body motion on undulating surfaces. The XC90’s acceleration is smooth and easy. The base engine performs with reasonable vigor, but the T6’s twin-turbo six-cylinder is noticeably stronger. Automatic-transmission shifts are smooth in both, but the T6’s four-speed changes gears more crisply. Other than a light growl on acceleration, the XC90 is quiet. The seats are firm but not at all uncomfortable. The second-row seats have good legroom and foot space, but the center position is painful and the third row is for children.